What is the Jewish holiday of Shavuot? Shavuot is an important Jewish holiday that celebrates the giving of the Torah to the Jews at Mount Sinai. The holiday always falls 50 days after the second night of Passover, and the 49 days in between the two holidays are known as the counting of the omer. The holiday is also known as Pentecost, since it is the 50th day after Passover. Shavuot originates in the Torah and is one of the Shalosh Regalim, or the three pilgrimage festivals along with Passover and Sukkot. "Offer a sacrifice to Me three times each year. Keep the festival of matzot (Passover) ... the reaping festival (Shavuot) ... the harvest festival (Sukkot) ... Three times each year, every male among you must appear before God the Lord ..." (Exodus 23:14-17). In biblical times Shavuot (שבועות, meaning "weeks"‎) marked the beginning of the new agricultural season. And you shall make for yourself a Festival of Weeks, the first of the wheat harvest, and the festival of the ingathering, at the turn of the year (Exodus 34:22). And the festival of the harvest, the first fruits of your labors, which you will sow in the field, and the festival of the ingathering at the departure of the year, when you gather in [the products of] your labors from the field (Exodus 23:16). On the day of the first fruits, when you offer up a new meal offering to the Lord, on your festival of Weeks; it shall be a holy convocation for you, and you shall not perform any mundane work (Numbers 28:26). Lastly, the Talmud calls Shavuot by another name: Atzeret (עצרת‎, meaning "holding back"), because work is prohibited on Shavuot and the holiday season of Passover and counting the omer conclude with this holiday. None of these texts explicitly say that Shavuot is meant to honor or celebrate the giving of the Torah. However, after the destruction of the Temple in 70 CE, the rabbis connected Shavuot with the revelation at Mount Sinai on the sixth night of the Hebrew month of Sivan when God gave the Ten Commandments to the Jewish people. The modern holiday thus celebrates this tradition. That being said, there are no mitzvot (commandments) specified in the Torah for Shavuot, so most of the modern celebrations and activities associated with the holiday are customs that have developed over time. In Israel, the holiday is celebrated for one day, while outside of Israel it is celebrated for two days in the late Spring, on the sixth night of the Hebrew month of Sivan. Many religious Jews commemorate Shavuot by spending the entire night studying Torah or other biblical texts at their synagogue or at home. This all-night gathering is known as Tikkun Leil Shavuot, and, at dawn, participants stop studying and recite shacharit, the morning prayer service. Tikkun Leil Shavuot, which literally means "Rectification for Shavuot Night," comes from midrash, which says that the night before the Torah was given, the Israelites went to sleep early in order to be well-rested for the big day ahead. Unfortunately, the Israelites overslept and Moshe had to wake them because God was already waiting atop the mountain. Many Jews view this as a flaw in national character and so stay up all night studying in order to rectify this historic blunder. In addition to all-night study, other Shavuot customs include reciting the Ten Commandments, also known as the Decalogue or Ten Sayings. Some communities also decorate the synagogue and home with fresh greenery, flowers, and spices, because the holiday has its origins in agriculture, although there were later ​midrashic tie-ins to relevant biblical texts. In some communities, this practice is not observed because the Vilna Gaon, an 18th century Talmudist, halachist (leader in Jewish law), and kabbalist believed the act to too closely resemble what the Christian church did. Also, Jews read the Book of Ruth (מגילת רות, meaning Megilat Rut) in English, which tells the story of two women: a Jewish woman named Naomi and her non-Israelite daughter-in-law Ruth. Their relationship was so strong that when Ruth’s husband died she decided to join the Israelites by converting to the Israelite religion. The Book of Ruth is read during Shavuot because it takes place during the harvest season and because Ruth’s conversion is thought to reflect the Jews' acceptance of the Torah on Shavuot. Furthermore, Jewish tradition teaches that King David (Ruth’s great-great-grandson) was born and died on Shavuot. The Hebrew word for dairy is chalav (חלב), whose gematria is 40, which corresponds to the 40 days and nights that Moses was on Mount Sinai. The Song of Songs (Shir ha'Shirim), which says, "Honey and milk are under your tongue" (4:11), not to mention the fact that Israel is frequently referred to as a land flowing with milk and honey. This line from Shir ha'Shirim is believed to compare the Torah to the sweetness of milk and honey. The believe that, prior to the giving of the Torah at Mount Sinai, the Israelites didn't have the laws of kashrut (kosher keeping), so they ate only dairy. 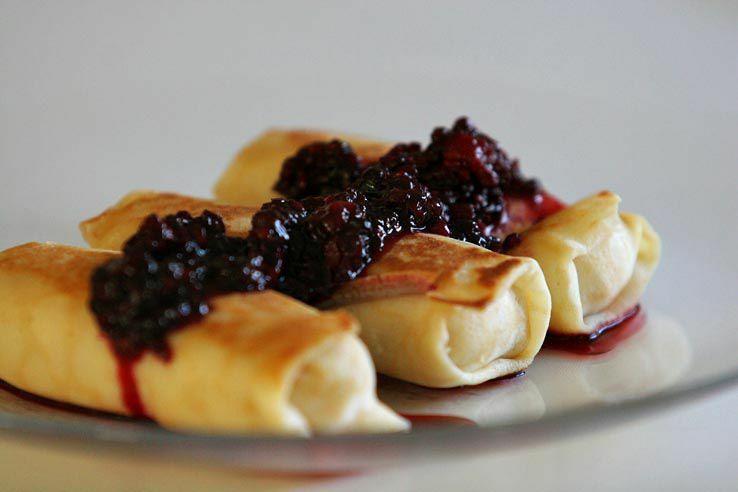 Thus, delicacies like cheese, cheesecake, blintzes, and more are commonly served throughout the holiday. In the 19th century, several congregations in the UK and Australia held groundbreaking confirmation ceremonies for girls. This established the earliest precedent for the future bat mitzvah ceremony. Additionally, in Reform Judaism, confirmation ceremonies have been held for nearly 200 years for boys and girls on Shavuot. Why Are There Four Jewish New Year's Days?